Here in the Hunt household we are getting ready. Last year we mocked those panicking and running up and stocking up on supplies for an October snowstorm. We laughed "who worries about a little snow in October". We were laughingg right up until we lost power while I had 8 pounds of pork carnitas on the stove and then didn't have power for eight days. It was one of the worst experiences we have been through as a family in that we were displaced out of our home, the clean up from downed trees was super expensive, and we lost all of the food in both of our fridges. So needless to say I may have a bit of PTSD when it comes to storms. I have a better plan this time around....should we loose power we are heading to my school which is the shelter for the town I work in. We have a full generator which means I can lock my family in my classroom and have full power, heat, and a smart board that can run movies, and wifi....considering what we lived in last year that is heaven on earth. Yet I know with every fiber of my being because I have prepared so well, nothing will happen because well, that is life! Then I started to think about this...I am an adult and I responded to this in adult manner and told that lady she had no right to say those things to me and make those accusations then I had a good laugh at this woman and clearly her major issues. As an adult I know how to process this sort of thing, get pissed off,and move on. What about my students who are surrounded by this sort of hating all the time. They get this sort of commentary all day long from facebook, twitter, and texting. They are surrounded by this all the time. It makes me sad for them. Sad that it wasn't like I was in high school where if someone was being a jerk to you-you went home to house and shut the door and tried to forget about. Now there is no safe place for them to get away from negative comments and the sort of nastiness that I came across this week. Although I did get upset I know I will not change what I do, how I do it, or who I am because of this troll on the internet....yet I know everyday there are kids whose whole lives are destroyed by stuff like this and for that I am really really angry. I am angry that an adult woman would do it and not know any better. Shame on her and anyone else out there who acts like that towards others. I know I have said this 1000 times but I am a lucky girl in that book companies give me books to review. It never gets old when I get asked to review a book that sparks my interest. I was recently asked to review a book that I couldn't say no to...it was called Sybil Exposed-The extraordinary story behind the famous multiple personality case. Admittedly I had ever seen the movie or read the book Sybil despite the fact that I teach psychology. So I went into this book only knowing general information about the story of Sybil. This book was AMAZING!!!! Seriously one of the best non-fiction books I have read. Probably second to Unbroken. The writer is Debbie Nathan who is a journalist so this book reads as though you are reading the transcript to a 20/20 special. Throughout the book you get to find out the real story of Sybil, her therapist, and the writer of the book. What you find out is shocking...like shock and awe shocking. It becomes clear to Nathan throughout her research that the real Sybil was not as sick as was portrayed in the book. That through a combination of embellishments by her doctor and the writer her real mental illness was nothing like what was portrayed in the book Sybil. Also, more disturbing was the fact that her therapist partially made up her diagnosis and didn't help Sybil get better, she often times made her worse. Including implanting memories into her subconscious while Sybil was highly drugged and under hypnosis. This book touches on so many aspects of the things that I teach in my psychology class. It discusses medical ethics, proper scientific method, and a doctor's responsibility to keeping her patients needs first rather than the what he/she thinks is best. At the end of the this book I found myself questioning something that I never had before-Is DID (multiple personality disorder's new name) as prevalent as doctor's say it is. 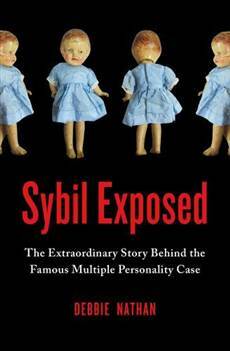 This book points out that Sybil and her case led to a huge rise in multiple personality diagnosis and this case was not even real. So scary to think that because of this how many people have been given a false diagnosis. Also at the end of this book I felt sad for the real Sybil. She had her mental health manipulated and as Nathan points out she could have lived a much more normal life then she did. She was forced into a a life of illness and infamy that she did not really deserve. I would give this book five stars and for me it is a must for anyone who is interested in psychology or mental illness. How cute is my wee one right here. She looks cute considering she isn't feeling well. She came down with a cold after we went and took family photos with my in-laws. I thought it was just because she didn't have a nap on Sunday but by Monday is was a wee booger filled mess. I could totally have sent her to daycare but she would have been miserable. So I decided to take a day off to spend with my little lady. I still struggle with taking time off because unlike "real" jobs-My work can't wait for me. I have to figure out what the kids can do and know that they are not going to get nearly as much out of their time with the sub than they will with me there. Yet, how could I not take the opportunity to snuggle up this little one. There are those moments where I wished I had more time for that. I am sad that now my little boy is sick and I can't stay home with him because I took today off. Good thing my mom is retired now and she can come over. Lets be honest the next best thing to a mom taking care of you is a grandma taking care of you. If I am being honest when I was a kid I loved having my Noni (Italian for Grandmother) to take care of me. Also, if I am being honest things around work have been getting crazy. There is this negativity that is seeping into all aspects of my job and I hate it. I sometimes feel like I need to shower the stank off when I get home. I probably needed this day as much as my wee little lady did. Maybe I am the one that needed the snuggles, maybe I am the one that needed the time on the couch watching the Disney channel, maybe I am the one who needed the day to recharge!!!! I have spent a lot of time over the last year or so trying to deal with my own lies. The lies about everything being perfect etc. So I hate when people lie. Yet some how I managed to get myself into a profession in which I get lied to more by 9am then most people do in their entire lives. Most of these are little white lies like I need to go to the bathroom which is secret code for I need to check my phone. Or I left my homework at home means I didn't even I had homework. Yet, there are lies that bother me. They are the ones that are told directly to my face that piss me off. On Friday I caught a student taking stickers off my desk. These stickers (other than being my sons) have no value to me and are easily replaced. When I asked her about this she told me she got them at Target. Now please picture this conversation going down with lots of teenage attitude and head wagging. She denied she took those stickers, and I know she did. I am much more upset about the lying then the actual taking of the stickers (who would care about stupid stickers) but that she would lie to my face about it. I then explained to her that I hope she would never steal from me because I would always give her whatever she needed as long as she asked for it and I had it to give. Then I asked her again and she in her special teenage attitude said "I told you Miss, I got it at Target". So I let it go. I let her walk out the room. Then I got pissed. Really pissed-and sad. I was pissed because of her entitled attitude (which sadly a lot of my students have). How dare she think it is ok to steal and then lie when you get caught. Yet, more than that I was sad. I was sad that no one had taught this young lady that she shouldn't lie and steal. That no one has taught her that when she has done something wrong rather than argue and give attitude she should apologize and ask to be forgiven. I am sad to think of what happens when it isn't just stickers. What happens when it is something bigger like a phone or money. Then that is when real trouble will start for her. I have let this sit for several days now and I think I might talk to her again about this. I might talk to her about how upset this has made me, yet I struggle with if I want to do that. I know myself if i go and talk to her and I get the same attitude I may loose my temper or get more mad and upset than I am now. Yet, if I don't know say anything I am just allowing her behavior to continue. I would never allow my own children to get away with acting that way and not addressing it, why would I allow this child to do so. Thoughts bloggy world? What would you do? Ok so we all know that motherhood is littered with guilt for a 100 different reasons. Well my latest involves the Catholic Church. Ok well let me know be so dramatic here. I signed Dylan up for his first little season of soccer. It is the first time on a little team and playing real games (if you can call them that). Well I also got a notice over the summer that CCD was starting at our local church for kindergartners. It is on Saturdays which I thought was crappy, but whatever it started the week soccer ended so I figured they must plan that so there is no overlap. Well they couldn't get enough coaches so soccer got delayed by two weeks so now there is a two week overlap. Both soccer games and CCD on the same Saturdays. Now I was hoping it would work out that our games wouldn't conflict by no such luck. The worst part the first day of CCD is team picture day so if Dylan goes to soccer and to the picture he would miss the first day of CCD. Then the last game of the season (where I think they give out medals) is also a conflict. So I asked the hubby, who I imagined would be of no help because lets just say his stance on the god thing and my stance on the god thing are a bit different. He suggested that we send him to CCD because lets be honest he won't remember and won't even know he missed the team photo....he is five and he doesn't really know the kids on the team because he goes to a magnet school anyways. I just feel bad because he really loves soccer and lets be honest about CCD as much as I am pro God and pro CCD soccer is a way better deal to a five year old! So I think I know that I will have him miss his last two weeks of soccer, but I feel bad. Yet, I know I will feel bad having to call him out of CCD not for a major conflict but for soccer. Damn you Catholic Guilt....Followed by Damn you mommy guilt!! !